¡HOLA MIS AMIGOS! For today’s On The Field Friday we’re going to throw a little Spanish flair on the field. Since 2006 the Milwaukee Brewers have worn jerseys emblazened with “Cerveceros” to commemorate their Hispanic Appreciation. The jersey above was worn this past week, and the mix of the wheat color with the spanish team name really sets it apart. While it is not the first time a team has worn their spanish name on their jerseys, this is the most unique in my opinion. 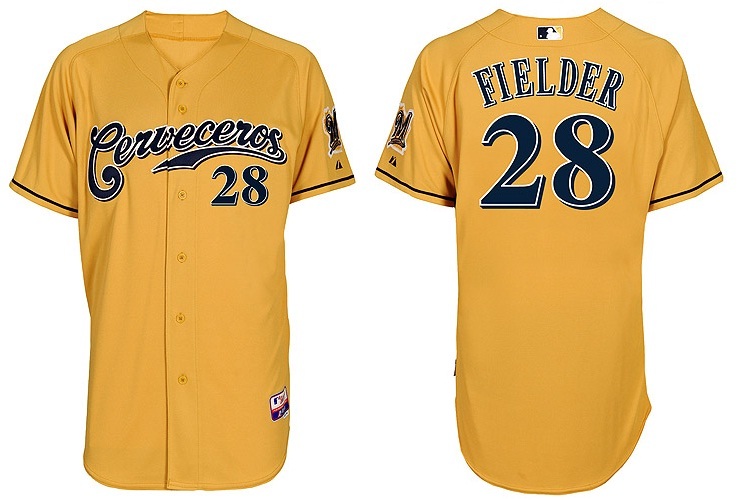 You can customize your own Cerveceros jersey at MLB.com. T.J. Lauerman June 15, 2011 June 15, 2011 No Comments on NCAA Football 12: Road To Glory Trailer Thoughts. NCAA Football 12‘s “Road To Glory” trailer recently came out. Head over to GameRant.com to watch the trailer and get my thoughts on this year’s new improvements. Today’s On The Field Friday brings us to one of my favorite jerseys of all time. 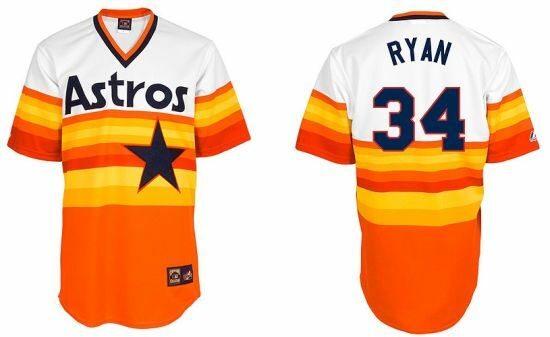 While it is my favorite jersey, I know this late 70s/early 80s Houston Astros jersey is very polarizing. While the oversize star is prominant, the most recognizable aspect of this jersey are the vivid orange and yellow stripes. 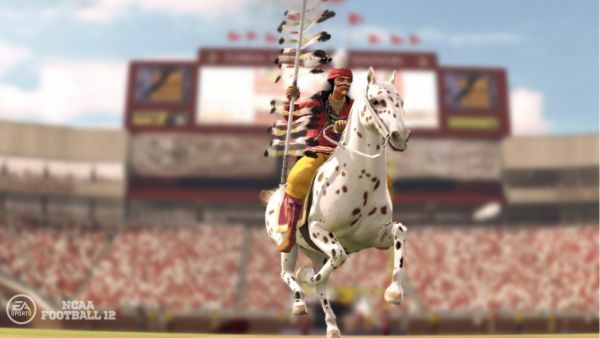 EA Sports enticed more people to follow their Twitter and Facebook pages by holding back the NCAA Football 12 demo date until they hit some milestone numbers. Finally, at 7:37pm EST, they twitted out the time. On Tuesday. 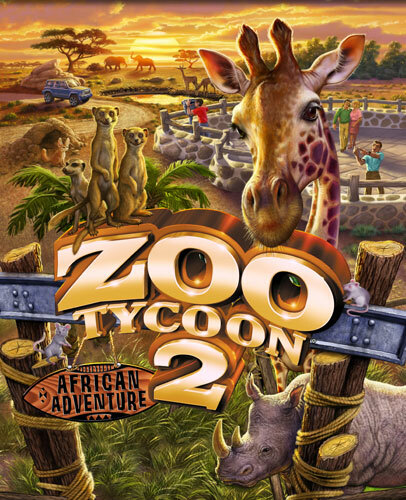 June 28th you will be able to get your hands on the demo for PS3 and Xbox 360. The full retail release is set for July 18, so this demo will give you two weeks to play with four, still yet to be released, teams. You will also be able to unlock five Nike Pro Combat uniforms for Alabama, Florida, Miami, Oregon State, and West Virginia. I’m really looking forward to this demo, as NCAA Football is consistently taking more and more time from my Madden time. I can’t wait to start a Dynasty with the Ohio State Buckeyes. Why you might ask? I’ll be able to start from scratch like Ed “Straight Arrow” Gennero did with the Texas State University Fightin’ Armadillos in Necessary Roughness. Mario & Sonic at the London 2012 Olympic Games comes out for Wii and 3DS this fall. This actually makes me want to get a Kinect.